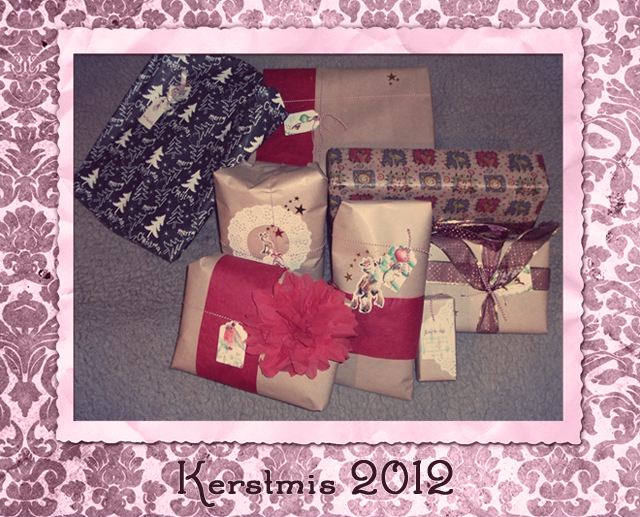 In the picture above you can already see how I wrapped all my presents, with the exception from the present wrapped in the shop (the blank one on the left). I wrapped most presents with plain brown paper en decorated them with red accents, like ribbons, rice paper, napkin flowers, paper doilies and kitchen cord in red and white. The labels were made with a pinch from cheap Christmas cards. Not all of these presents contained hand-made gifts, but more to follow about those later! I like the color combination of brown & red. I had read the your comment on my blog. I’m happy to hear that you are learning Japanese. Also I am try to learning English.